Sun, swimming & good times are what you’re into, then the Thai Islands are all yours. 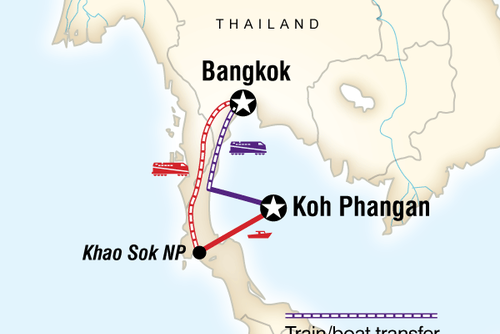 Jump your way from Koh Samui to Koh Tao, finishing it up with the legendary Koh Pha Ngan. With multiple nights on each island, you can sit back on island time. Take it up a notch if you want & swim & snorkel off white sand beaches, go hiking in emerald green forests, or choose to chill on the beach & sip cocktails from a coconut as you really relax & indulge. Arrive on the island of Koh Samui – the third largest island in Thailand & an area known for its spectacular natural beauty, beaches & good times. Check-in to your hotel & use this afternoon hit the shops or start working on your tan at the beach. The evening, meet up with your Trip Manager & fellow travel buddies, before heading out to explore some of Chaweng Beach’s nightlife. 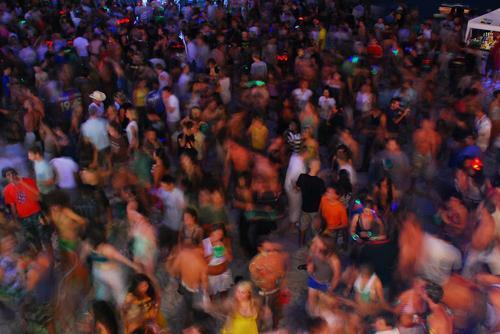 This place is known for it’s cool party scene which is quite literally right on the beach. So relax & get onto island time. Koh Samui has got something for everyone, so with 2 full days here, get ready for a taste of everything the island offers to it’s travellers. During the day, there are long stretches of beach with soft, white sand dotted around the island for you to take advantage of and the chance to soak up the rays, swim, snorkel & relax. Explore the local town for a generous dose of the lifestyle here. Head down the little side streets for an authentic Thai feast - you’ll find lots of local delights like Pad Thai, delicious exotic curries & fresh flavours at some unbelievable prices! Or take it up a level & enjoy a cocktail or try fresh coconut served to you right on the beach! You could take a tour of the island to see some of the local sites or visit a Buddhist temple with a 15m (50ft) statue of the Buddha. Built in 1972, this statue is respected by locals & visitors alike – many of whom light incense & pray here with offerings of fruit & flowers. With loads of free time ask your Trip Manager for some tips & suggestions of things to do, like a visit to Wat Khunaram with it's mummified monk or the uniquely shaped formation of the Grandmother & Grandfather rocks. At night this island goes off! Spots like Chaweng, the island’s most popular beach, come alive with other travellers & locals alike. With so many bars & clubs located right on the beach, it’s the perfect place to party with your travel buddies, locals & new mates. 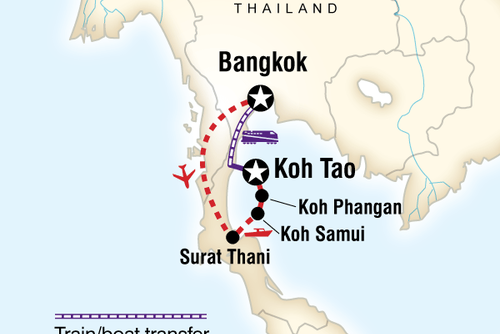 It’s time for a change of pace as we take a short ferry journey across the Gulf of Thailand to the island of Koh Tao, also known as Turtle Island. 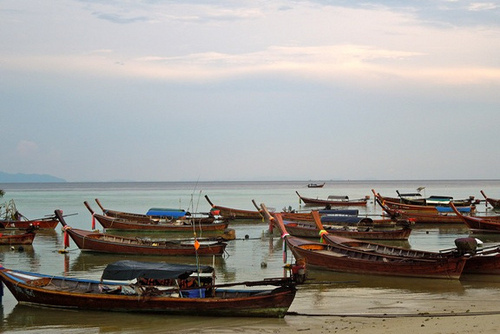 Smaller than Koh Samui, Koh Tao is famous for its underwater scenery & laid-back lifestyle. After arriving, your Tour Manager will take you on an orientation walk of the island so you can really get your bearings of where you’re keen to head back to. You’ve then got the afternoon to relax on the beach, or grab a snorkel & head underwater! Tonight it's an included dinner on the beach with some local specialities. 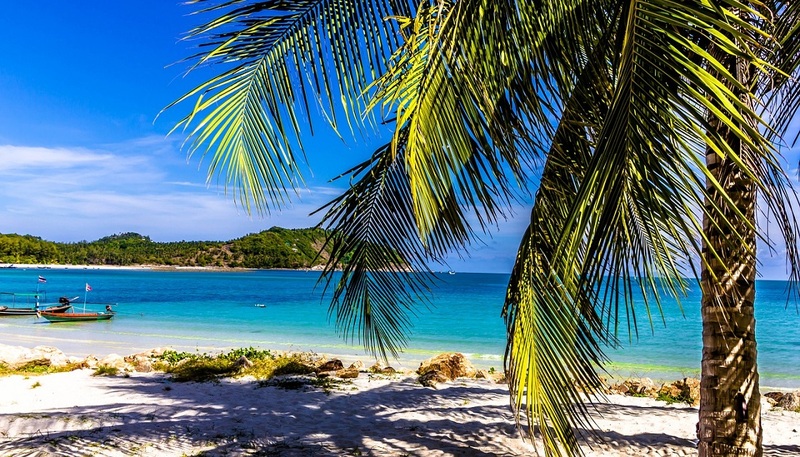 Wake up on Koh Tao & get ready for a slice of paradise. 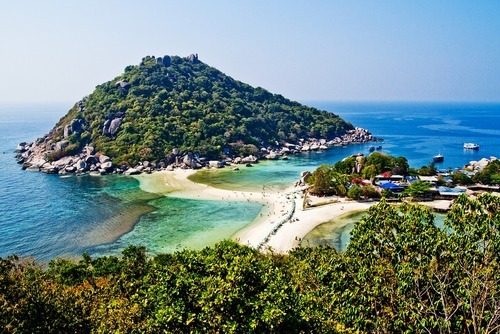 Koh Tao is known for its submerged scenery, so it’s a not-to-miss experience when you visit. Snorkeling is a fantastic way to explore the island’s underwater world. Fins, snorkels & masks can be rented from lots of places throughout the island for a small cost. Ask your Tour Manager for some advice on the best places to head & get ready for some unbeatable sights, colourful fish & vibrant sea life. Otherwise, take it easy & maybe opt for a swim in the warm waters. If the underwater scene isn’t what you’re into, then there are loads of other things to experience here. If you’d prefer to keep things on land & venture out on foot, you could explore some of the island’s hiking trails. With its hilly landscape there's a lot to explore & great views to check out here. There’s also the opportunity to join our optional day cruise if you feel like getting out & about. You'll be taken to some great snorkeling spots around Koh Tao. There are beaches all over Koh Pha Ngan to chill out on, each offering different activities for travellers visiting the island. You could make your way to Haad Yao beach, a quiet spot that’s great for swimming & snorkeling. You could also treat yourself to a bit of pampering if you wish - there are lots of places to have a Thai massage while listening to the waves lap against the shore. With close access to excellent dive spots, Koh Pha Ngan is quickly developing a reputation as a great learn-to-dive location too! 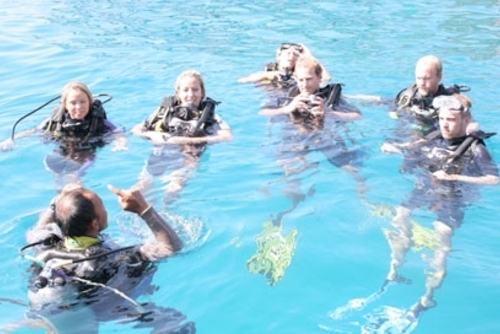 If you have a diving certificate or want to learn how, you could head out on a boat & explore some of the island’s key diving spots while you’re here. By night, this island is the place to go out! Try it local & enjoy the lively night scene. 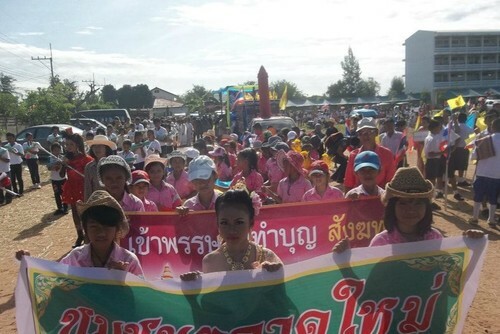 Whether it is a Half Moon Party, a Black Moon Party or Full Moon party – there is always something going on in Koh Pha Ngan! I did this trip a few years ago and it was amazing! I was a bit apprehensive at first It was my first time travelling solo (I had only really done group holidays with my girlfriend / friends previously) but what a trip it was. 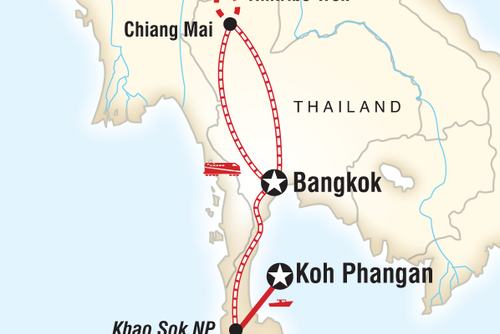 I would highly recommend Thailand/this tour/Contiki to anyone. I made good friends who I'm still in touch with today the trip was such a laugh and Thailand is stunning!